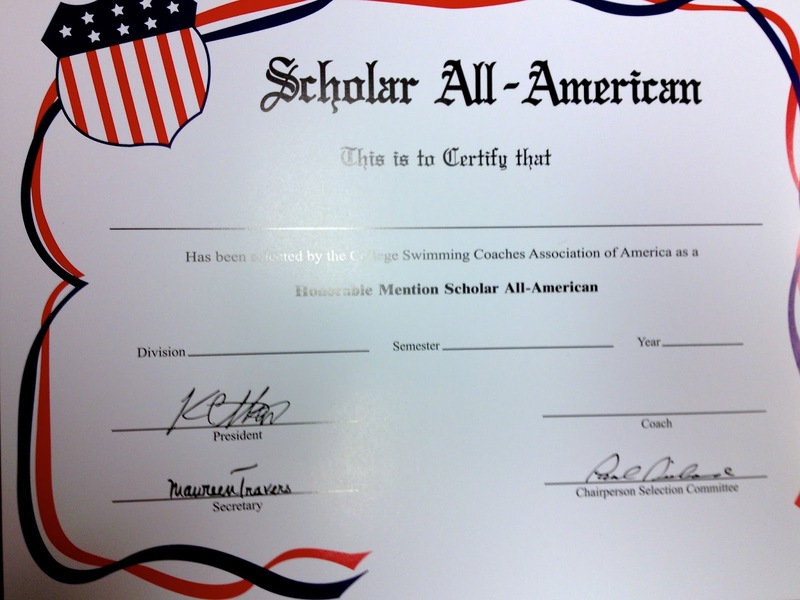 The Bobcat Chronicle: ACADEMIC ALL AMERICANS! One of 10 "soon to be filled out" All-American Awards! The College Swimming Coaches Association of America (CSCAA) recently announced their Scholar All American Teams and athletes. In order for a team to be awarded this honor the team GPA has to be over 3.0 for the semester. Bates men and women averaged 3.25 this year! It was great to see the program break 14 school records, go 150 lifetime bests, and have a GPA that strong. 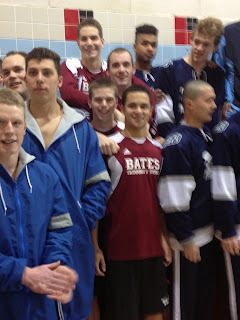 It has been over 15 years and 30 semesters that Bates Swimmers and Divers have achieved this honor - and I am proud that his past group continued to demonstrate exactly what being a student-athlete at Bates is all about. Further, we set our record for the number of individual awards in one season too! Last season we had NINE athletes go NCAA provisional cuts (B-Cuts). If you are fast enough to get a B-Cut there is a good chance you will be one of the 18 or so athletes invited to the National Meet in that event. Having nine in one season was great. Even cooler was that we had two relays go very strong B-Cuts... showing us that our program's goal of getting a relay to that national meet could soon be a reality. Back to the awards though... In order to be an Individual Scholar All-American you have to achieve the B-Cut time and also have a 3.5 GPA (or higher) during that semester of work. I couldn't be prouder to say that we had EIGHT accomplish this. That is the ultimate display of being a student-athlete. Going lifetime bests, setting records, achieving national level times, doing homework, studying, writing papers, and nailing exams. You CAN do it all... and at Bates we not only believe that, but do it!